smart is a German automaker that builds micro-sized cars for the road. 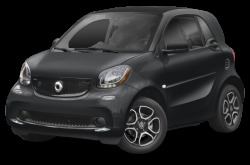 For 2018, smart offer only one model: the fortwo electric drive. It may look cute, but it offers some sporty features like standard LED daytime running lamps and 15-inch alloy wheels. As its name implies, the fortwo electric drive seats two passengers. It can come as either a coupe or a cabriolet. It is driven by a 80-hp electric motor and a 55 kw lithium ion battery. It earns a combined MPGe rating of 109 by EPA. The cabriolet has a soft-top roof that can be retracted at the push of a button in 12 seconds. It can even be manually stored in the trunk. The gas-powered fortwo model has been discontinued.